I love to experiment with all sorts of ingredients when baking muffins. Nothing makes me more happy than when they turn out well. I get inspired all the time and constantly have new ideas of what to put in or replace. There is just one little problem after baking the muffins: I love their taste and everything but I actually don't eat them. This is because I prefer other foods for breakfast and I rather have fruits 'n nuts 'n stuff for tea to get me through to dinner. Only way out: bake lesser muffins at a time, so my husband doesn't have to eat the same style muffins for days in row. And have lots of play dates for my kids where I can feed not just the kids but also their hungry mothers and siblings. This banana oat muffin made it straight into the Top 5 of my muffin hit list. It works with just one tablespoon of added oil. Spices in muffins open a whole new world of flavors with an endless list of possible variations and combination. The allspice and ground cardamom really make the muffins here, making it unnecessary to add more sugar or other flavor enhancing ingredients. Preheat oven to 180C. Line muffin tin with oil or muffin liners. In a bowl, mash the banana. Add yogurt, eggs, agave syrup and oil. Stir until well combined. Set aside. In a separate bowl stir together all dry ingredients except the chopped almonds. Gently fold wet ingredients into dry ingredients. Stir in raisins. 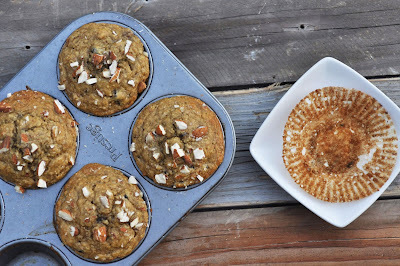 Pour batter into muffin tins. Sprinkle with chopped almonds. Bake for 18-20 minutes.